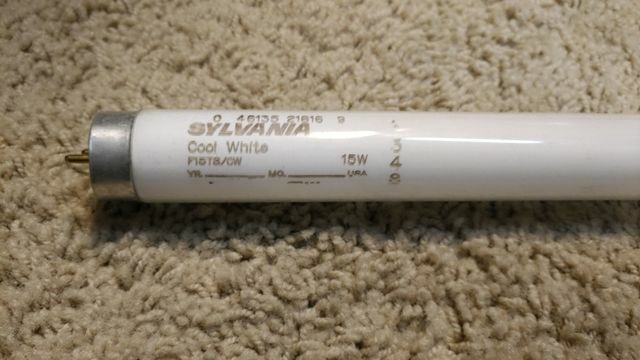 I spotted this box of 14 Sylvania F15T8/CWs at the ReStore. The lamps and box did not have a price. I took the box to the cashier and made an offer. I made an offer of $2.40 and she accepted! That means I got 14 F15T8/CWs for approximately 6 cents each!!! Application/Use: For any F15T8 fixture. Great bargain! Do you know the age of these? Thanks! They are made in April 1993. Not that old, but worth saving and made 2 years before the 1995 Halophosphate ban. That is good to know. I’m trying to get older bulbs anyway. How did the ban affect the bulbs? I’m trying to learn more about why the newer ones are all junk. The ban took away our favorite halophosphate colors such as CW, WW, D, CWX, WWX, and W from our favorite lengths such as 18", 24", 36", 48", and 96" and required the colors to be 70 CRI or higher. Some of the newer ones are better, like the ADV series from Philips and SPX series from GE. Those are worth saving if you find them. Thanks for the info. That is good to know. Those were manufactured at the Danvers, MA plant which closed 4/98. What's odd is there's also an encircled "v" at the end of these lamps. FYI, the halo phosphate ban applied only to the 48" and 96" lamps, at least as far as I know. Even the 2012 regs only applied to such as far as I know. The exception was the 34w and 60w and 95w lamps, which were halo phosphate until 2012. Oddly, though, I do have some GE F40SP35/WM, so high CRI colors in reduced wattage obviously did exist.